1. Love tea? Make that afternoon tea your special time of day with a fancy Bleus d’Ailleurs teacup set from Hermes. 2. 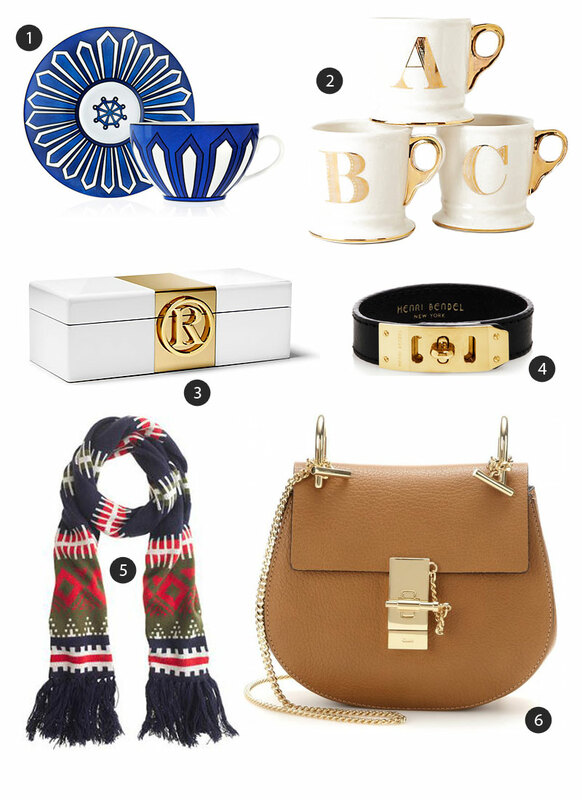 Feel chic sipping coffee in the morning from this limited edition golden monogram mug from Anthropologie. Now only $8! 3. Ensure your jewelry box is just as pretty as the jewelry inside with this Monogram Jewelry Box from C.Wonder. 4. Enjoy Hermes-esque edgy style with this Whitney Turnlock Leather Bracelet in classic black leather from Henri Bendel. 5. Be ready to hit the slopes or cozy up in front of the fire with this adorable Fair Isle Stripe Scarf from J.Crew. 6. Indulge in the It bag of the season with this small Drew bag in Tan from Chloe.